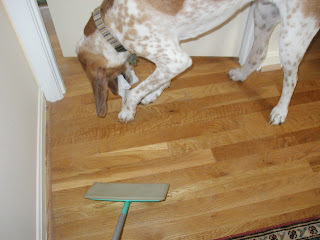 Swiffer Sweepers, the latest in interactive toys for blind dogs, debuted today in the Ray the Blind Dog household. It takes little effort and cleans your house at the same time! Warning: Do not let the blind dog catch the Swiffer. Once he disengages the cloths and starts slapping himself in the face with it, you will need more than a Swiffer to clean up the mess.